Two late penalties saw Sheffield take the spoils with virtually the last kick of the game as Mark Ireland held his nerve to land his sixth penalty, leaving Fylde with two bonus points when the full five had been well within their grasp. 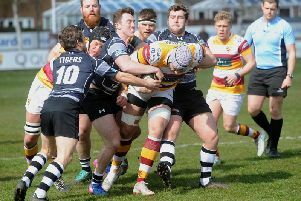 Fylde were left to rue a high penalty count which went 19 to 10 against them. Crucially they gave away the last four penalties of the match, three in kickable positions, as Ireland overturned a 24-16 deficit with 13 minutes to go. Sheffield kicked off and, after initially looking promising, Fylde struggled for fluency with two knock-ons in the first few exchanges. Ireland gave Sheffield a sixth minute lead with a penalty before Fylde responded seven minutes later. A penalty to touch gave them good field position with perfect ball from the lineout seeing Connor Wilkinson jink inside and carry the cover tackler over the line for a fine try. Greg Smith’s attempted conversion drifted wide but Fylde had their noses in front at 5-3. On 23 minutes, another breakdown penalty against Fylde was kicked by Ireland to edge Sheffield back in front at 6-5. Back came Fylde as a penalty for a tip tackle on Ollie Parkinson gave them good field position. The lineout was solid once more, and after a couple of drives, Dave Fairbrother picked a great line to crash through the defence and stretch out for a second try and a 10-6 lead. Excellent breaks from Tom Carleton and Adam Lanigan were negated by penalties and, right on half-time, Ireland, landed his third kick to make it 10-9 at the break. Fylde were awarded two penalties in the opening couple of minutes in the second half. The second was very kickable but a decision was made to tap and go, only for a loose ball to fly into touch. On 45 minutes, a missed tackle saw Sheffield break 50 yards and gain a penalty in Fylde’s 22. Two scrums and penalties followed before a third scrum saw quick hands allow Henri Packard the room to squeeze in at the corner with Ireland’s touchline conversion giving Sheffield a 16-10 lead. Eight minutes later, however, and the lead changed hands again as Tom Carleton glided through and ignored Henry Hadfield before cutting back inside and offloading for Smith to score under the posts with his conversion making it 17-16. Fylde were then reduced to 14 men temporarily as Matt Garrod was sinbinned for what was judged a swinging arm in the tackle. Nevertheless, they extended their lead six minutes later as Tom Grimes’ break ended with Harlan Corrie muscling his way over in the corner and Smith’s conversion putting them 24-16 up. This was reduced on 67 minutes when a loose pass in their own 22 and failure to exit gave Sheffield another penalty kick at goal, cutting the gap to five points at 24-19. Nerves increased further when, on 78 minutes, another penalty was kicked for slapping the ball out of a Sheffield player’s hands, leaving the visitors 24-22 adrift. As the game neared added on time, Fylde were penalised on the Sheffield 22 for kicking the ball out of the ruck. A kick to touch and successful lineout saw Sheffield with the ball just inside the Fylde half, where the referee adjudged that the Fylde defender had competed too long and the tackle had become a ruck. Sheffield were awarded their 19th penalty of the game and up stepped Ireland to make it 25-24. There was only time to restart the game, see Sheffield catch the ball and kick to touch before the final whistle went, leaving Fylde players, coaching staff and fans deflated and frustrated. Fylde: Carleton, Hadfield, Briers, Wilkinson, Grimes, Smith, Lanigan; Fairbrother, Vernon, Corrie, Parkinson, Garrod, Ashcroft, Gregory, Horner. Replacements: Joyner, O’Ryan, Ashcroft, Burtonwood, Fowden.